If you are in Small Business and don’t have time to create visual content then grab a coffee and listen up. Let me introduce you to Brandr… a tool that will save you time, inspire you to be creative and allow you to create visual social media content on the fly. Which gives you more time to get back to what you do best …. run your business. You may have heard me rave (quite literally) about a tool called Studio recently. If you missed it, you can read about Studio here. Studio is an amazing app for creating images using other people’s designs (remixes) or your own and has really cool layouts, layers, icons, illustrations, fonts and effects. It’s one of my favourite apps. This post is not about Studio. And you guessed it – Brandr was developed by the same team as Studio, and we will get to why that is awesome in a moment. 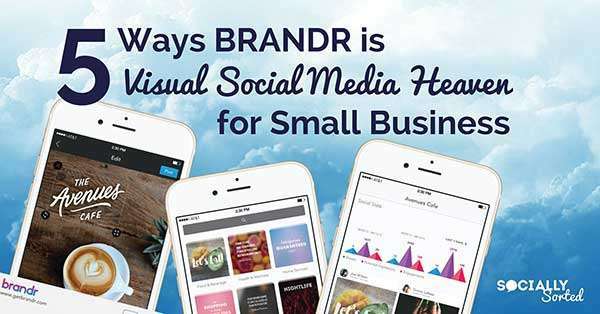 While Studio is an app designed for consumers to create visual content (that small business owners have used effectively as well) Brandr is designed JUST for small business. So let’s take a look at why Brandr is so awesome and why it could be the perfect fit for you and your small business. 1 You can get started for free or upgrade. There are two levels of membership with Brandr – free and pro ($10 per month). Brandr comes set up with a free library of ready-to-post stock images, quotes, memes and small-business specific shareables like quotes (in categories – so the ones suited to YOU are easy to find). You can access them right away with the Free Account which makes it perfect for a small business owner that just wants to get started at low cost. But here’s the cool thing – you can easily also access all the layers, designs and overlays in the Studio app by doing a search on the Brandr app (Brandr links through to Studio’s database). 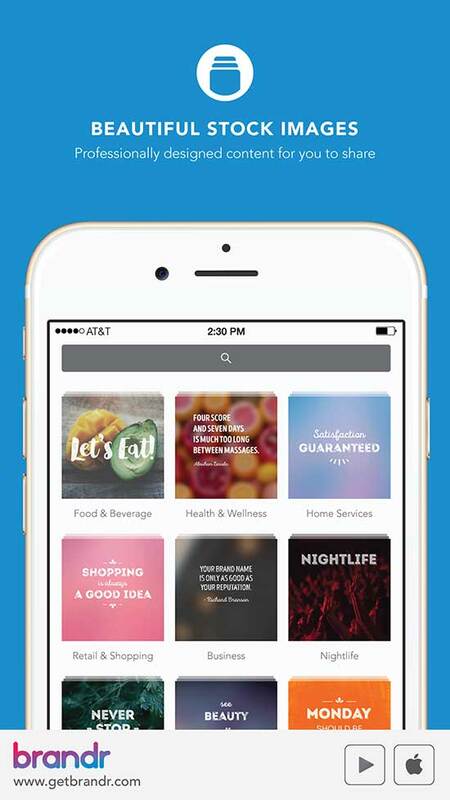 You can get started on Brandr for free on iTunes or Android or upgrade for more features! a bigger library of quotes and shareable images across a range of categories or image kits, so you can easily find those relevant to your industry. More images are being added all the time by Brandr’s design team. more team members – you can add up to 5 team members to your account which is great for encouraging your employees to share content easily and quickly. 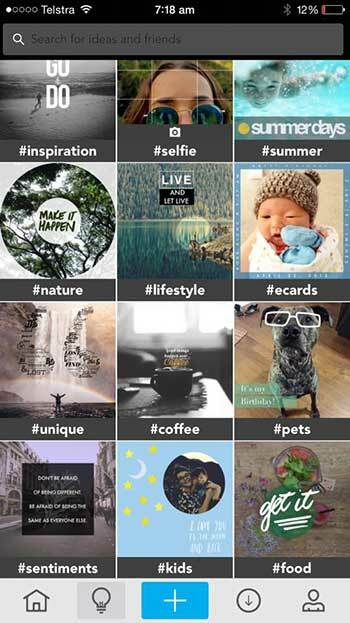 the ability to create unlimited posts for your visual social media strategy. The thing I like about Brandr is that you get a LOT for free. And then when you love it (note I said when, not if) you can choose to upgrade for the full kit and kaboodle. 2 You can quickly and easily create branded images. 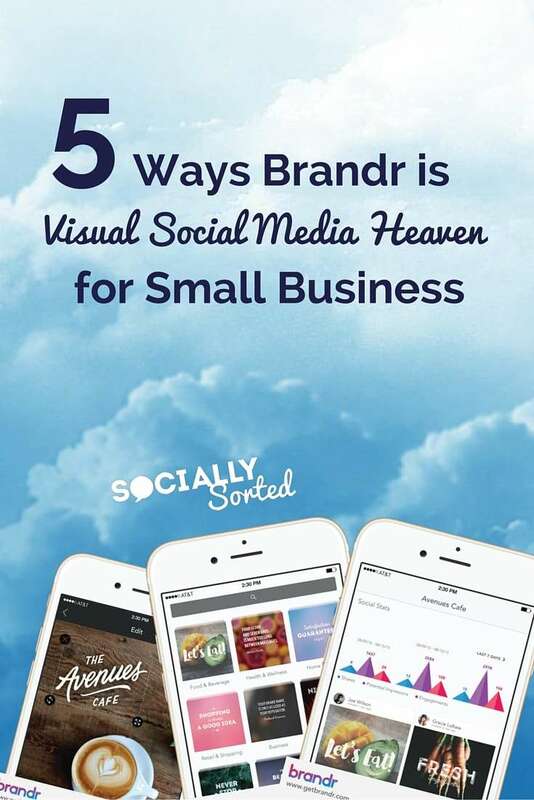 It’s super easy with Brandr to to create branded images for visual social media. Studio has been so awesome that Brands flocked to it for business use… but one small limitation meant that it was not possible to upload logos and branded images unless you were a huge brand like Starbucks or Nissan. (Fun Fact: these guys worked with Brandr to develop a suite of images for fans to use and Starbuck’s coffee overlays and Nissan’s road trip overlays were pretty cool, I must say). 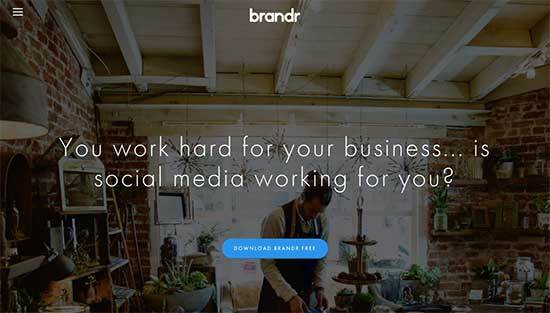 Brandr, on the other hand was designed by the Studio team with small business in mind. It’s not about consumers – it’s about you, the small business owner. So the ability to brand your images is the focus. You simply upload images and logos into the system and you are good to go. They are all ready to use as overlays. For me personally I like to use PNG format with a transparent background, but you can also use SVG files or files with backgrounds as well. And don’t forget – if you run a promotion or have a special product you want to include – you can add your logos for any product or service. Just add it in the app and you are good to go! 3 It’s perfect for the on-the-go small business owner. Let’s face it. Most small business owners don’t have a lot of time to sit down and create a bunch of images. There are some professions where it’s just not that easy. If you are out and about, the easiest way to post content, as a small business owner, is on your mobile. Sure I always recommend batching and planning and doing a bunch of images at once.. but in reality it’s not that easy if you are in a job where it takes you away from a desktop computer for hours of the day. But a mobile phone is always handy. The beauty of Brandr is that the tool is in your hand so you can find or create visuals to share on the go – and you can brand them quickly and easily (with a Pro account). Everything is mobile – the sharing, creation and even tracking of your stats (we will get to those in a moment) is all done from your phone. And if you have a small business team (even if it is your wife or husband) then you can easily have them access the Brandr account to create and share content too (or up to 5 people if you have a bigger team). Brandr has a huge library of beautiful stock images that you can literally click on and share (or brand them if you wish) – they are yours to use! You get a whole swag of them on the free account but access is opened up to the full library with the Pro Account. And Brandr’s design team is constantly adding new ones all the time. And the best part is that they are organised into categories so if you are a fitness expert or a coach or a restaurant you can instantly add the most relevant categories or “kits” of images to your app ready for easy access. 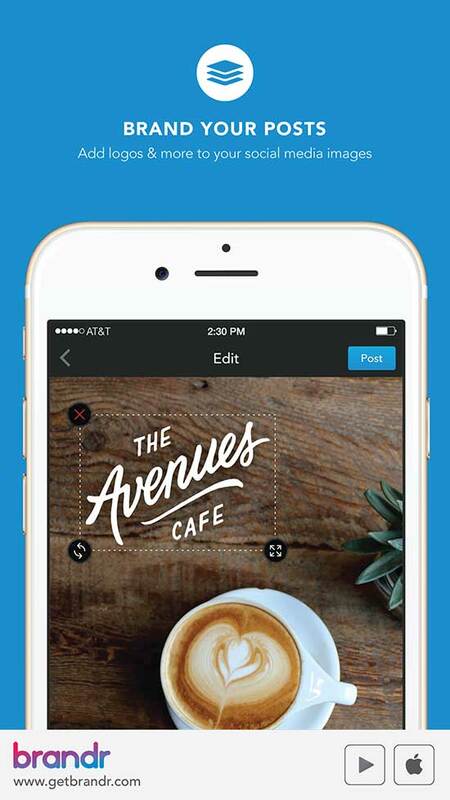 And of course you can add your own photos or take photos from within the app too – and add overlays or logos as you wish. So what’s the double whammy? 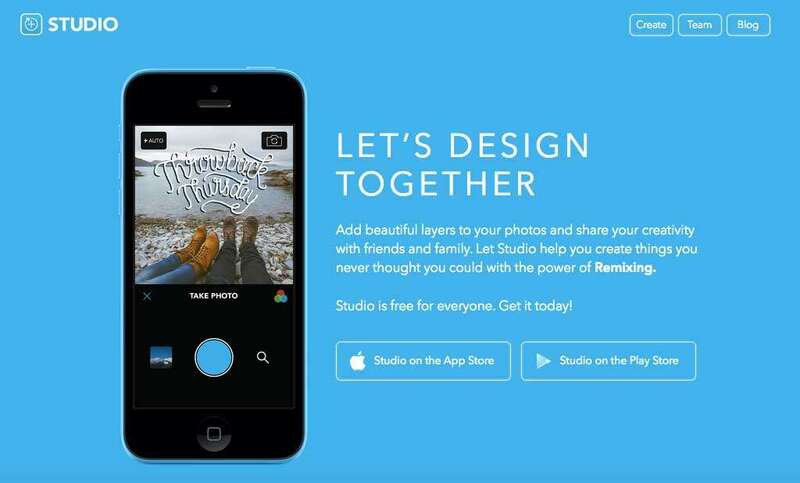 I mentioned Brandr’s sister app, Studio here. Studio has thousands of awesome layouts (icons, illustrations and layers) to choose from in the library of designs – with more and more being added everyday by the app and by users. What’s that got to do with Brandr? You can access every single one of them from right within this Brandr! No switching between apps. Cool, hey! That means you not only get Brandrs awesome image kits (by category) but you also get all of Studio’s resources as well. I don’t know about you, but to my mind, any app that lets you kill two birds with one stone is a handy app to have in your pocket! And of course, once you have finished creating your images, you can easily share them to all of your favourite social platforms from right within Brandr. Oh and the other double whammy is that it is available on iPhone and Android. The feature set is not quite as expansive on Android as it is on iTunes but hey, it’s ON Android which is a great start (note, there is no tracking as yet) but this will be evolved. Brandr has another cool feature on the Pro Level – analytics. You can track your posts and work out what is working and see shares across all networks. 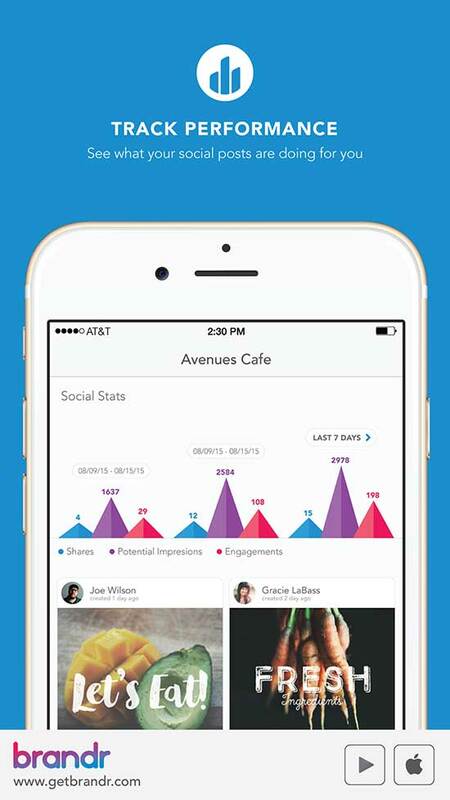 You can also track content created by each user. Brandr also allows you to see which posts team members have shared and what the results were in terms of reach and shares. Tracking encourages team members to share more as they can see instant results. In fact, overall Brandr is pretty intelligent – you get a great mix of categorial content, intelligence about what to post and which hashtags to use and analytics on performance. Cloud Image by Shutterstock – Pin it for later! Now don’t get me wrong, this post or tool is not meant to replace what you already love and use. 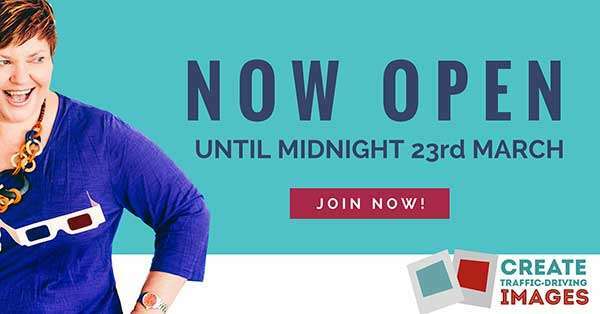 If you are a Canva user, you can jump on a desktop and bang out a bunch of images in an hour or two then keep doing what is working. But even if you use other tools, I think that Brandr is worthy of a place in your arsenal of visual social media tools. And if you are a time-strapped one or two-person small business show who works mainly off your mobile. Then yes, this tool might well be “heaven” for your business. Regardless, it’s free to try, so download it and give it a test run! I will be playing with Brandr a lot more this year. Will you be trying it out too? Let me know in the comments below or if you are a small business owner who is using Brandr, let me know the industry you are in and how it is working for you!